Arc flashes are one of the deadliest electrical hazards. These sudden , explosive releases of energy cause thousands of injuries every year, some with devastating long-term effects. Workers who are required to work with or around arc flash hazards must understand the risks involved and how they can protect themselves and their coworkers. The National Fire Protection Association, or NFPA, and the Occupational Safety and Health Administration, or OSHA, outline electrical safety requirements for general industry and construction activities to lessen the risk of electricity-related injuries and fatalities. Imagine that you have two metal rods. One is connected to an energy source, and electricity is flowing through the rod. The electricity wants to flow out to the second rod, but it can’t because it is insulated by the surrounding air. But if we turn up the voltage higher than the breakdown voltage of the air, the current will be able to discharge, or jump, to the other rod. As the electricity flows through the air it will create plasma, which gives off light, heat, sound and pressure. If this discharge happens abruptly and then ends, we call it a spark. But if there is a power source that continues supplying a strong current, the spark will evolve into a continuous discharge called an arc discharge, or electric arc. This evolution can happen so rapidly that it appears to be instantaneous. Electric arcs that are not wanted or controlled are known as arc faults. The NFPA defines an arc flash hazard as “A source of possible injury or damage to health associated with the release of energy caused by an electrical arc.” In other words, if an arc fault could occur which has enough energy to cause substantial damage, injury, fire or other harm, there is an arc flash hazard. Arc flash hazards actually consist of two separate hazards: the arc flash and the arc blast. The arc flash, also called a flashover, is the light and heat produced by the arc fault. The arc blast is the pressure wave created by the discharge of energy. 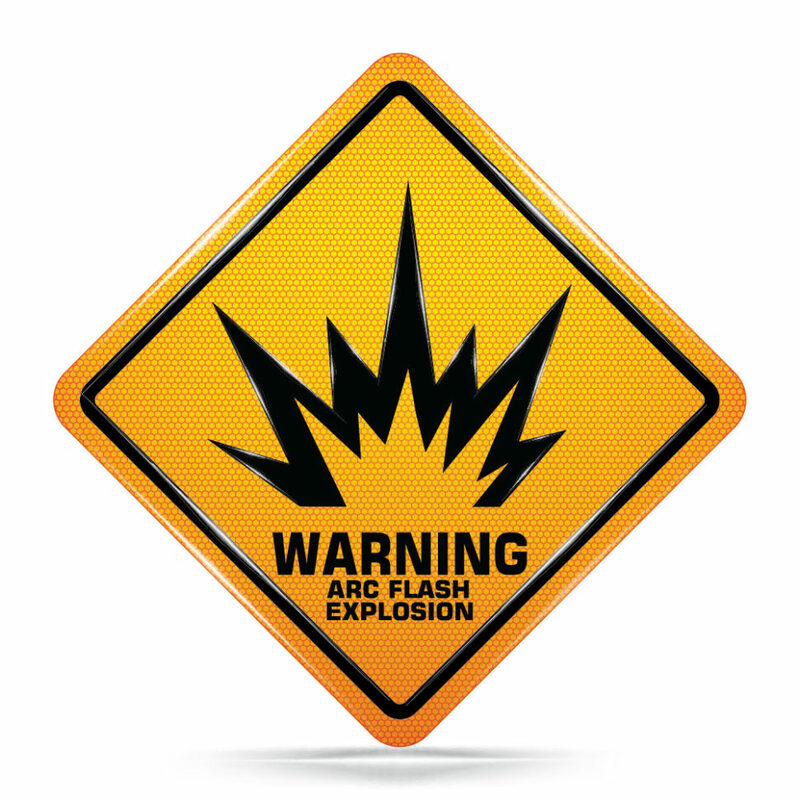 What are the Hazards Associated with Arc Flashes? Arc faults can be incredibly dangerous for anyone in the vicinity. The most obvious danger is from shock and electrocution if the arc discharge jumps to a person. The flash can reach extreme temperatures, up to 35,000 degrees Fahrenheit, which is four times hotter than the surface of the sun. This can instantly cause severe burns, even from several feet away, and can cause clothing and other combustible materials to melt onto skin or burst into flames. The flash also gives off intense UV radiation, which can temporarily blind and disorient workers, as well as cause corneal burns and other eye injuries. The arc blast can create a pressure wave with a force up to 1,000 pounds. The pressure alone can rupture ear drums, collapse lungs, cause internal injuries, and knock people off their feet or send objects flying into them, leading to further injuries. The heat and the pressure from the blast can instantly melt or vaporize metal components, sending superheated and possibly toxic vapors into the air, which can cause lung damage and a variety of other health effects. The blast can also send tiny molten metal droplets and other superheated shrapnel flying considerable distances. Click Here to See a Free Demo! 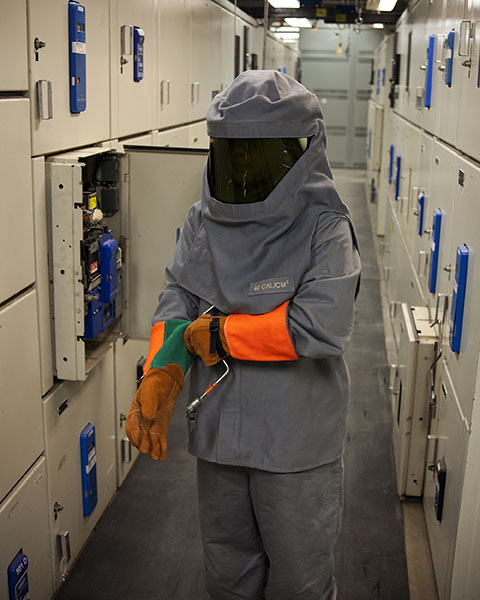 How Can I Keep My Employees Safe from Arc Flash Hazards? Any time there is an electrical hazard in the work area, the NFPA and OSHA require that three boundaries are set. You should already be familiar with the restricted approach boundary and the limited approach boundary, which deal with shock hazards and are determined by the nominal system voltage of the exposed circuit or energized conductor. The third boundary is the arc flash boundary. This boundary is calculated as the approach limit, or distance from the potential arc source, at which the incident energy from an arc flash could equal 1.2 calories per centimeter squared, which is the amount of energy associated with the onset of second degree burns. Your electrical safety program must include a procedure for performing an electrical risk assessment before electrical work is carried out. The risk assessment is used to identify hazards, including shock and arc flash hazards, and assess the level of those hazards. The estimated level of risk is based on factors such as the design and configuration of equipment, the overall condition of the equipment, the presence of safety devices, the potential incident energy, and the type of work that must be performed. Once the types and levels of risk have been established, the risk assessment is used to determine the proper controls and PPE that must be used, including the size of the arc flash boundary, if an arc flash hazard exists. Results of the assessment and required controls and procedures must be documented, and a new risk assessment must be performed any time conditions change. All employees who work with or near arc flash hazards must receive proper training. Qualified workers must receive rigorous, in-depth training before they are permitted to enter the arc flash boundary. Whenever possible, qualified workers should establish an electrically safe working condition by disconnecting, discharging, locking and tagging equipment before performing work on it. Your facility must follow all applicable energized electrical work permit requirements and keep your electrical safety program up-to-date. SafetySkills covers these topics and more in our Electrical Safety: Arc Flash course. For more information, click here. Discover more SafetySkills courses today!